We help our customers define their needs, then leverage our experience to provide best practice solutions, accurate budgets, scheduling, execution of work, and testing / commissioning where needed. 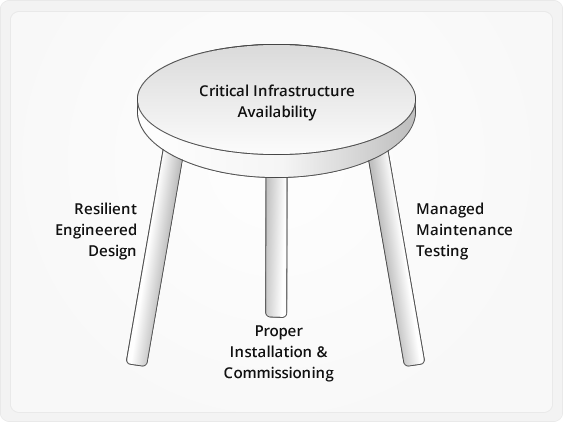 We take a comprehensive approach to critical infrastructure and understand the interrelationship between design, installation, and testing & maintenance that is required for providing operational availability. CB Critical Systems can provide a needs assessment to assist in determining power, cooling, fire-suppression, monitoring, and maintenance requirements for your critical environment. Thank you CB Critical Systems, for the invaluable role you played in the successful buildout and commissioning of our Chantilly Data Center in 2015. You joined the project for the commissioning phase (which was the one of the best decisions we (ATI) made); you peer reviewed the design and work progress as the first order of business and thoroughly explained the gaps in the design and implementation that you identified. Your team worked with us and other sub-contractors to implement the required changes which greatly enhanced the final product. Your in-depth knowledge and vast experience with electrical and mechanical systems in critical facilities, and with providing design, construction, installation, commissioning, testing and maintenance services, provided us (ATI) with a unique perspective and understanding of the project. We were impressed with the high level of professionalism you displayed and say thanks again for the wonderful job you guys did. Keep up the good work and we look forward to a continued business relationship. Thanks for helping us renovate our I.T. space. Your firm did a great job explaining the pro's and con's of the various options - which allowed us to get the needed power and cooling redundancy. The job was on schedule and budget, and without incident - we look forward to working with you again in the future! I can’t thank you all enough for the excellent job you all have done for us. The out of the box approach along with the attention to detail you all bring to the table is shown in every job. My Client has complimented you all on numerous occasions around how smooth and well organized the projects have gone. Thanks again guys and keep doing what you do best. I wanted you to know that in the past several years that CB Critical systems has been handling our maintenance for our generators, UPS system, and ATS, it has been a pleasure working with you all. When you have power issues in a Data center it is always an emergency and I appreciate the professionalism that the staff at your office provides to us. I look forward to a long business relationship. CB Critical Systems engineered a solution to add an additional emergency generator to the Owens & Minor Home Office Facility that other engineers did not see. The solution fit our budget, saved us down time and was less expensive than other quotes. The entire project went smoothly and the end result was exactly what was promised. Copyright © 2019 CB Critical Systems. All Rights Reserved.